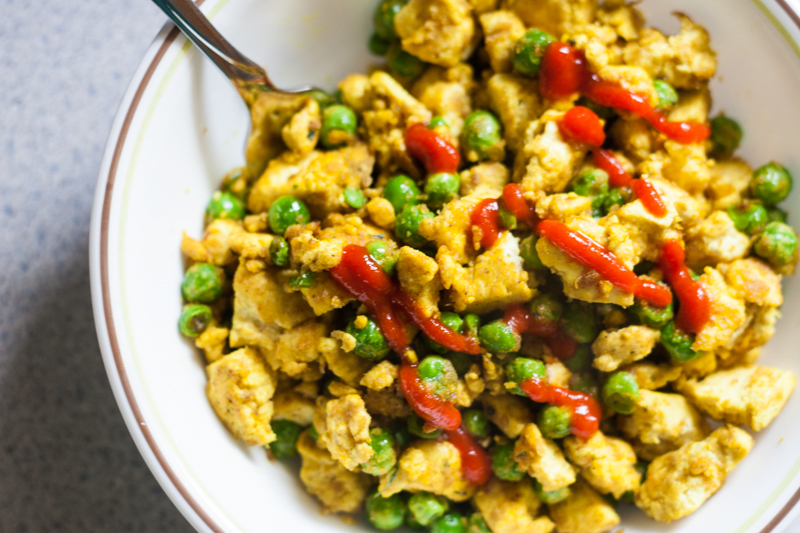 Knowing how to make a good tofu scramble off the top of your head is basically a vegetarian necessity, and it is soooo easy. Once you have a basic recipe, like this one, you can add and change ingredients to fit whatever you’re craving! So once you master the basic recipe, get creative! Start by heating olive oil in a large skillet. Crumble the tofu with your hands into a bowl, and mix in the garlic powder, turmeric, and parsley. Once the olive oil is hot, add the tofu to the skillet and cook, turning every few minutes, until the tofu pieces are golden brown. Once the tofu is golden brown, add in the peas and nutritional yeast, stirring to coat the tofu. Cook for another 1-2 minutes. BAM, there’s your basic tofu scramble. Make it more fun by serving in tortillas, or over tortilla chips with some salsa and black beans. Serve for breakfast, lunch, or dinner. I love hearing how people transform recipes…comment with your favorite seasonings and add-ins to the basic tofu scramble!